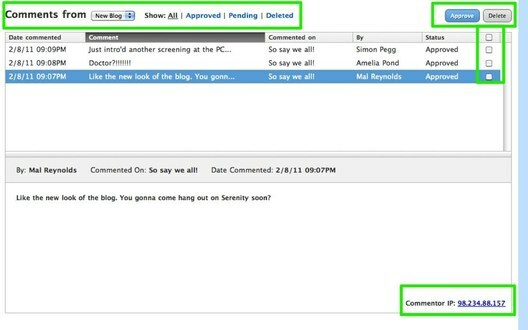 We have comments turned on by default for all of your blog posts, allowing visitors to your to comment on any posts you've made unless you turn comments off under your Blog Settings. These comments appear underneath each individual post in the order in which they were added. You should reply to your comments using the same comment feature all of your readers use. Additionally, if you (or any other commenter) replies directly to another comment, that comment will appear directly underneath the original comment and will be part of a thread connected to that comment. Any other replies to that comment will appear as part of that same thread. We notify you of these comments via the email address associated with your account (you can change this to a different address for the blog under settings). 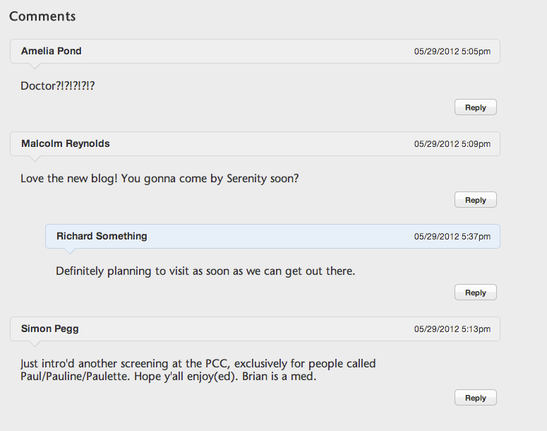 The comments can be read directly on your site or under the Blog Comments area for the blog in your account. How can you access this Blog Comment section for the site in your account? Go to the main page of your account, click the Comments tab. This will bring up the comment area. You can read and delete comments for all the blogs on a site here. And if you turned on comment moderation (comments are not moderated unless you turn this on) via the Blog Settings, you'll be able to approve the comments from here.